Writing to you as the editor of Nieman Reports,www.niemanreports.com, certainly not the most trendy Web site you've ever seen, but we hope one offering something of value, primarily I suspect for journalists, though a few others venture our way, too. Heading toward our Summer 2010 issue — in the planning stage now, and so I'd welcome the chance to talk with you. 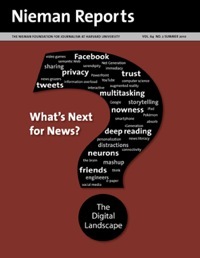 Topic: your 2010 "big question" -- many of the answers to which I've read on your Web site — which draws a direct line to the core of what we are going to be exploring —-through the voices and experiences of journalists and others — in the Summer 2010 issue of our magazine, to be published in June. Edge posed this question; discover how a wide range of thinkers responded. As each new year approaches, John Brockman, founder of Edge, an online publication, consults with three of the original members of Edge—Stewart Brand, founder and editor of Whole Earth Catalog; Kevin Kelly, who helped to launch Wired in 1993 and wrote "What Technology Wants," a book to bepublished in October (Viking Penguin); and George Dyson, a science historian who is the author of several books including "Darwin Among the Machines." Together they create the Edge Annual Question—which Brockman then sends out to the Edge list to invite responses. He receives these commentaries by e-mail, which are then edited. Edge is a read-only site. There is no direct posting nor is Edge open for comments.? Brockman has been asking an Edge Annual Question for the past 13 years. In this essay, he explains what makes a question a good one to ask and shares some responses to this year's question: "How is the Internet changing the way you think?" It's not easy coming up with a question. As the artist James Lee Byars used to say: "I can answer the question, but am I bright enough to ask it?" Edge is a conversation. We are looking for questions that inspire answers we can't possibly predict. Surprise me with an answer I never could have guessed. My goal is to provoke people into thinking thoughts that they normally might not have. ?? John, you pioneered the idea of asking smart folks what question they are asking themselves. Well I've noticed in the past few years there is one question everyone on your list is asking themselves these days and that is, is the Internet making me smarter or stupid? Nick Carr tackled the question on his terms, but did not answer it for everyone. In fact, I would love to hear the Edge list tell me their version: Is the Internet improving them or improving their work, and how is it changing how they think? I am less interested in the general "us" and more interested in the specific "you"—how it is affecting each one personally. Nearly every discussion I have with someone these days will arrive at this question sooner or later. Why not tackle it head on? Yet, we still had work to do in framing our question. When people respond to "we" questions, their words tend to resemble expert papers, public pronouncements, or talks delivered from a stage. "You" leads us to share specifics of our lived experience. The challenge then is to not let responses slip into life's more banal details. For us, discussion revolved around whether we'd ask "Is the Internet changing the way we think?" or probe this topic with a "you" focused question. Steven Pinker, Harvard research psychologist, author of "The Language Instinct" and "The Blank Slate," and one of several distinguished scientists I consult, advised heading in the direction of "us." I very much like the idea of the Edge Question, but would suggest one important change—that it be about "us," not "me." The "me" question is too easy—if people really thought that some bit of technology was making their minds or their lives worse, they could always go back to the typewriter, or the Britannica, or the US Postal Service. The tough question is "us'"if every individual makes a choice that makes him or her better off, could there be knock-on effects that make the culture as a whole worse off (what the economists call "externalities")? Many people sense this, but don't want to think about it because the change is too profound. Today, on the Internet the main event is the Web. A lot of people think that the Web is the Internet, and they're missing something. The Internet is a brand-new fertile ground where things can grow, and the Web is the first thing that grew there. But the stuff growing there is in a very primitive form. The Web is the old media incorporated into the new medium. It both adds something to the Internet and takes something away. Playwright Richard Foreman asks about the replacement of complex inner density with a new kind of self evolving under the pressure of information overload and the technology of the instantly available. Is it a new self? Are we becoming Pancake People—spread wide and thin as we connect with that vast network of information accessed by the mere touch of a button? Technology analyst Nicholas Carr, who wrote The Atlantic cover story, "Is Google Making Us Stupid?," asks whether the use of the Web made it impossible for us to read long pieces of writing. Social software guru Clay Shirky says the answer is " ‘too soon to tell.' This isn't because we can't see some of the obvious effects already, but because the deep changes will be manifested only when new cultural norms shape what the technology makes possible. ... The Internet's primary effect on how we think will only reveal itself when it affects the cultural milieu of thought, not just the behavior of individual users." Web 2.0 pioneer Tim O'Reilly ponders if ideas themselves are the ultimate social software. Do they evolve via the conversations we have with each other, the artifacts we create, and the stories we tell to explain them? Stewart Brand, founder of Whole Earth Catalog, cannot function without the major players in his social extended mind—his guild. "How I think is shaped to a large degree by how they think," he writes. "Thanks to my guild's Internet-mediated conversation, my neuronal thinking is enhanced immeasurably by our digital thinking." Hillis goes a step further by asking if the Internet will, in the long run, arrive at a much richer infrastructure in which ideas can potentially evolve outside of human minds. In other words, can we change the way the Internet thinks? The 2010 question elicited, in all, 172 essays that comprised a 132,000-word manuscript published online by Edge in January. Kelly speaks about a new type of mind, amplified by the Internet, evolving, and able to start a new phase of evolution outside of the body. In "Net Gain," evolutionary biologist Richard Dawkins looks 40 years into the future when "retrieval from the communal exosomatic memory will become dramatically faster, and we shall rely less on the memory in our skulls." Nassim Taleb, author of "The Black Swan," writes about "The Degradation of Predictability—and Knowledge" as he asks us to "consider the explosive situation: More information (particularly thanks to the Internet) causes more confidence and illusions of knowledge while degrading predictability." Nick Bilton, lead writer of The New York Times's Bits blog, notes that "[the] Internet is not changing how we think. Instead, we are changing how the Internet thinks." Actor Alan Alda worries about "[speed] plus mobs. A scary combination." He wonders, "Is there an algorithm perking somewhere in someone's head right now that can act as a check against this growing hastiness and mobbiness?" New York Times columnist Virginia Heffernan writes that "we must keep on reading and not mistake new texts for new worlds, or new forms for new brains." Marina Abromavic: "My Perception of Time"
Stefano Boeri: "Internet Is Wind"
Tony Conrad: "A Question With(out) an Answer"
James Croak: "Art Making Going Rural"
Olafur Eliasson: "The Internet as Reality Producer"
Eric Fischl and April Gornik: "Replacing Experience With Facsimile"
Terence Koh: "A Completely New Form of Sense"
Hans Ulrich Obrist: "Edge A to Z (Pars Pro Toto)"
Jonas Mekas: "I Am Not Exactly a Thinking Person—I Am a Poet"
Matthew Ritchie: "The Interface I Want Is the Real World." In the North Pacific Ocean, there were two approaches to boatbuilding. The Aleuts (and their kayak-building relatives) lived on barren, treeless islands and built their vessels by piecing together skeletal frameworks from fragments of beach-combed wood. The Tlingit (and their dugout canoe-building relatives) built their vessels by selecting entire trees out of the rainforest and removing wood until there was nothing left but a canoe.?? The Aleut and the Tlingit achieved similar results—maximum boat/minimum material—by opposite means. The flood of information unleashed by the Internet has produced a similar cultural split. We used to be kayak builders, collecting all available fragments of information to assemble the framework that kept us afloat. Now, we have to learn to become dugout-canoe builders, discarding unnecessary information to reveal the shape of knowledge hidden within. I was a hardened kayak builder, trained to collect every available stick. I resent having to learn the new skills. But those who don't will be left paddling logs, not canoes. The Edge project was inspired by the 1971 failed art experiment entitled "The World Question Center" by the late James Lee Byars, John Brockman's friend and sometime collaborator. Byars believed that to arrive at an axiology of societal knowledge it was pure folly to go to Widener Library at Harvard and read six million volumes. Instead, he planned to gather the 100 most brilliant minds in the world in a room, lock them behind closed doors, and have them ask each other the questions they were asking themselves. The expected result, in theory, was to be a synthesis of all thought. But it didn't work out that way. Byars identified his 100 most brilliant minds and called each of them. The result: 70 people hung up on him. A decade later, Brockman picked up on the idea and founded The Reality Club, which, in 1997, went online, rebranded as Edge.